In this Episode of the Hyper-V Amigos Didier Van Hoye (aka @WorkingHardInIT) and I are talking about the Livemigration improvements in Windows Server 2012 R2. We demonstrate the migration of four VMs with 10GB memory each over standard TCP/IP, TCP/IP with Compression, SMB3 with Multichannel and SMB Direct. Last Sunday Didier and I recorded our second Episode of “The Hyper-V Amigo Showcast”. 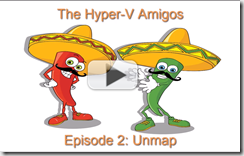 This time we discussed the Unmap Feature in Windows Server 2012 and R2. Didier is so fortunate that his employer has a Dell Compellent SAN Storage that really shines with Unmap. So we took the opportunity to demonstrate a lot of the Unmap feature.